This Virtue was included in the Man O' War box-press sampler tin purchased from CI for $39.95 ($4.00 per stick) . The normal mail order price for the Virtue runs about $5.75 per stick if purchased in boxes of 22. 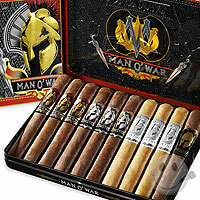 This was my first time smoking any type of Man O' War and found it to be a very pleasant cigar. It was on the mild side, was easy to light and had a nice even burn rate. The flavor remained constant the entire length of the cigar and I smoked it all the way down to a 1" nub. I am looking forward to the other samples in this mix and at $6.00 per stick it's a bit out of my budget as a daily smoker, but I don't think you will be disappointed if you get your hands on a few of these gems. This is the third selection (Victor Sinclair '55 sun grown) from the Bohemian sampler. Again another mild cigar that seemed to lack much flavor until about the half way point, it did however have a pleasant aroma and was very easy to light with an even burn rate. There was a huge problem with this stick; almost immediately the wrapper self destructed and was completely gone with over 2" of cigar yet to smoke. Once the wrapper was gone the binder began to unwrap and I had to ditch the final 2" of a nice light cigar. I was unable to find this exact cigar for sale on any of the major online retailers so I have no idea what the per-stick price is, but it was a nice addition to this sampler other than the wrapper problem. This sampler was purchased from cigarsinternational.com at a price of $19.95. It contains 10 well presented handmade cigars in a Spanish cedar box from Victor Sinclair. 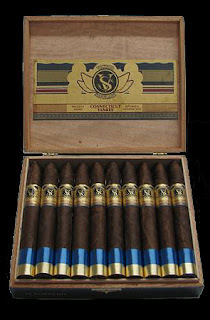 The first stick I chose from the sampler was the Connecticut Yankee. This cigar with a dark Connecticut wrapper turned out to be an immediate winner. 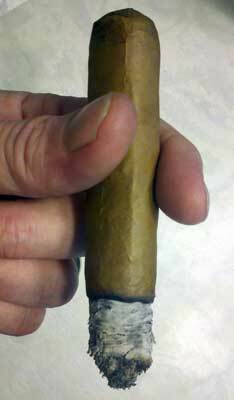 This cigar was very tasty with hints of chocolate and coffee, with a very easy draw that stayed cool down to a 1" nub. This is perhaps the best tasting cigar I have ever smoked and I will be buying more of these since that online price is just over $2.50 per stick. The second stick smoked was the Bohemian Red with a Corojo wrapper. This was by far the easiest lighting cigar that I have ever smoked. It was mild and pleasant smoke but had a bit of an uneven burn rate. Overall this was a very nice cigar that was easy to light, had a great draw and stayed cool down to a 1" nub. This cigar would make a good addition to any humidor retailing in mail order packs of 10 for $5.70 per stick. 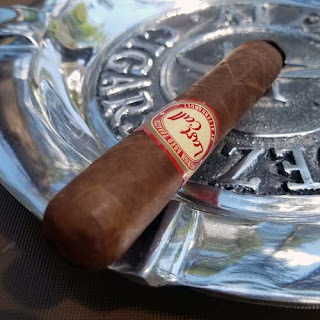 Since my shoulder injury and the fact that I am no longer attending a university I am going to change the direction of this blog from sociology to an average persons cigar review site. I may not be the most knowledgeable cigar smoker in the world, but I do know which cigars I enjoy and which that I don't and I will share this information with anyone that wants to read it.